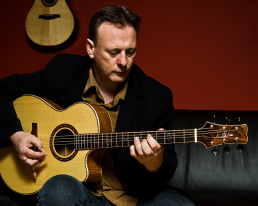 Today his live work ranges from intimate solo performance through his trio with brothers Gary and Greg Grainger to the quartet Men of Steel (with fellow guitarists Dan Crary, Beppe Gambetta and Don Ross). He is an enthusiastic collaborator both as a leader and as a sideman having worked with, among many others Dougie McLean, Phil Cunningham, Mairi MacInnes, Liam O’Flynn, Martin Simpson, Kevin Burke, Alison Brown, Martyn Bennett, Natalie MacMaster, Patrick and Jacky Molard, Mairead ní Mhoanaigh and Dermot Byrne, The Nashville Chamber Orchestra, John Jorgenson, Jean Michel Veillon, Catriona Macdonald, Seikou Keita, Xosé Manuel Budiño, Ewen Vernal and Andy Irvine. He is also in great demand as a studio musician having contributed to over 60 albums. In addition to his solo output Tony has worked with both singers and instrumentalists providing his distinctive sound on many successful projects. His 2009 release “The Maker’s Mark” saw him showcase 15 of the finest luthier built guitars available. Recording a solo piece on each instrument, the project caught the attention of the mainstream rock guitar press in a way that acoustic work rarely does.